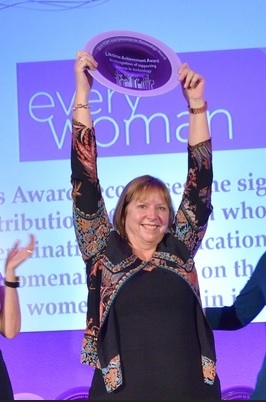 If you haven’t already seen, Dame Wendy Hall won a Lifetime Achievement Award at the 2014 FDM everywoman awards this week. Dame Wendy Hall is a professor of computer science at the University of Southampton and a founder of the Web Science Research Initiative. This is the third year I have attended the awards and it was a nice surprise to see Wendy presented with the first award of the day. I met Wendy when she spoke at Computer Weekly’s women in IT event last year. In addition to taking part in our speakers’ panel she made it on to our Top 25 Most Influential Women in IT list for the second year running. The Top 25 is made up of ladies who the judges feel are role models that will be important to the future diversity and success of the tech community. So what has Wendy done to make her so influential? She started out by studying undergraduate and postgraduate degrees in mathematics at the University of Southampton. She returned to the university in 1984 to join a newly created computer science group. There her team invented the Microcosm hypermedia system. In 1994 she was appointed as the University’s first female professor of engineering. She then served as head of the School of Electronics and Computer Science from 2002-2007. Along with Professor Sir Tim Berners-Lee, Professor Nigel Shadbolt, and Daniel J. Weitzner, she founded the Web Science Research Initiative, which was launched in 2006. In 2000 she was awarded a CBE in the Queen’s Birthday Honours list, in addition to becoming a Fellow of the Royal Academy of Engineering (FREng). To quote Wikipedia who feature Wendy’s long list of achievements: “She was appointed Dame Commander of the Order of the British Empire (DBE) in the 2009 New Year Honours. She is a Fellow of the British Computer Society (FBCS) (also serving as President) and a Fellow of the Institution of Engineering and Technology (FIET). In 2002, she was appointed a Fellow of the City and Guilds (FCGI). Wendy also holds honorary degrees from Oxford Brookes University, Glamorgan University, Cardiff University, the University of Pretoria and Loughborough University. And if you’re somehow not yet convinced why she’s so deserving of the 2014 FDM everywoman award she also tutored Computer Weekly’s editor in chief Bryan Glick at University! Congratulations Wendy, from Computer Weekly and WITsend on your Lifetime Achievement Award.